For more than 20 seasons in the NFL, Mason L. “Red” Cashion’s trademark “First dowwwn!” call echoed through the autumns. 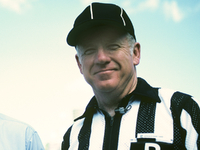 Cashion’s signature and enthusiastic first down call made him one of the NFL’s most memorable officials over the years. “Somehow I think I wanted to say, `Hey, I’m enthusiastic about this game and I want everybody else to be that way, too,’” Cashion told the Chicago Tribune in 1996. Cashion, born in November of 1931 in College Station, Texas, was inducted into the Texas Sports Hall of Fame in 1999, was the voice of the official in several editions of the Madden NFL video game and in 2013 released his autobiography First Dooowwwnnn … and Life to Go! Are the New York Rangers & Anthony DeAngelo a Good Fit?